I broke my Xtracycle frame the last day of April and am only getting around to mentioning it on the blog now. It’s been so long I almost let it pass without comment, but figured the info may help someone else down the road. First of all, I should be clear. It’s not really the frame—more the undersized tongue where the front attachment plate sandwiches the chainstays near the bottom bracket. I shouldn’t have been surprised. I’d been hearing this creak, creak creak—first when climbing out of the saddle (which isn’t unheard of for someone my size), then later even when seated (which is unusual, even for us giant folks) and only applying moderate muscle. I kept checking the torque on the three attachment points and even looked for cracks on my Rockhopper frame and the X where it was visible. Everything seemed fine. Finally, the night before “Bike to Work Month” started, I couldn’t take the embarrassment of a noisy bike any longer. I vowed to pull the Xtracycle off the bike frame, coat up the “Special Nut”/dropout contact points with anti-seize and put an end to the creak once and for all! It wasn’t to be. As soon as I backed off the Special Nuts torque, … CLUNK! 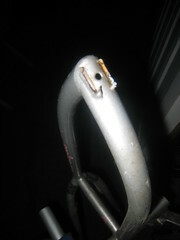 What was left of the tongue snapped under the weight of the bare Xtracycle frame. On closer inspection, this piece obviously had been failing for a while. It’s hard to tell from the photo but there’s surface rust on the break, meaning the puny welds had been failing for a while. Sheesh, would it have killed them to beef that weld point up a bit? A small gusset perhaps? Still, at least it held until I got to the workstand, rather than failing on a downhill with kids on the Snapdeck! So here I was, the night before the big bike commute month kickoff and me, the BikeJunction team captain without a bike. Or was I? A mere hour later I had the old longbike frame joined to my Rockhopper and was ready for the morning commute. I figured I’d send my Xtracycle frame in for a warranty claim and do the swap again in a few weeks. That was the plan anyway; six weeks later is still hangs in the garage. Check your tongue! Right now. A bit of reinforcement with the original design would have gone a long way. A gusset would have been great. 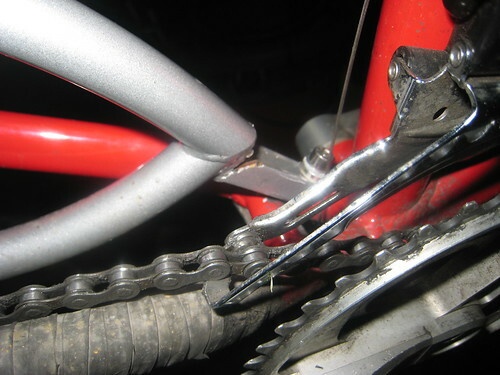 Even better, a flat, plate-like tongue could probably serve a couple purposes — more metal-to-weld contact and the plate would spread out the forces on the chainstay bridge like an upper FAP. The donor frame has some issues with the disc mount. 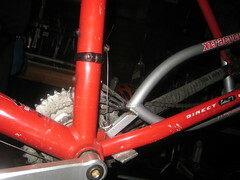 I pulled the rear Avid brake off my original Xtracycle and it should have bolted right on the donor. Instead, the caliper rubbed the rotor, almost as if the mounting bosses were dialed in for 201mm rotors instead of 203mm spec. A presta valve “nut” worked under the mounts as a spacer, but I’m still wondering if they had a bad batch or something. Anyone seen this? The Big Dummy and other custom Xtracycle options are looking kind of nifty. Less to break. Finally, and I’m serious about this, check your Xtracycle for cracks! You might be able to do it with a flashlight and some creative neck craning, but if you have any creaks or squeaks you’ve been trying to ignore, pull the frame and check it out up close! Has anyone else out there broken their Xtracycle? Had it warrantied? I’m starting to think it may not be worth the shipping hassle and time delay to send it back. I may just have someone tack the tongue back on there (reinforced, of course) and be done with it. Summer’s coming, and with my luck I’m going to need a spare. This entry was posted in bikes, buildin' the xtracycle, wrenchin', xtracycle and tagged bikes, Commute, crack, failure, warranty, xtracycle. Bookmark the permalink. Welcome to the club, Tim. I’ve broken mine…um…five?…yeah, five times. Most of the breaks I chalk up to exceeding the design specs on a daily basis, but there are some built in weak points. Most riders will never have a problem, as they will not want to carry the type of weight that can do this, but you are right, checking things periodically is a good idea. As for the disc mount, what you noticed is pretty much normal for the X. The mount works with a 208 rotor, but a bit of extra spacing is needed. A different mount could be designed that would eliminate this, but adding a spacer is acceptable, too. You could return it to XtraCycle, but they are completely out of stock for the next two months, so that may not do you much good. On the other hand, as a result of my experiences, I have come up with a reinforcement strategy that will make your FreeRadical much stronger and more durable than stock, while adding less than an ounce (I think, haven’t actually weighed the bits, but they’re light). I did several for the boys who are Riding the Spine ( http://www.ridingthespine.com/ ). The three bikes they are on right now are: a Big Dummy, a custom made longtail known as the Chupacabra, and an XtraCycle reinforced by me. As far as I can tell from their Journal, they have had no problems with the X, which has gone from Arizona to Panama so far, offroad mostly. Considering that they used to break one every thousand miles or so, I feel pretty good about the reinforcement system. Let me know if you’re interested. val, neither of your links has pics or even a description of the modifications you mention. could you provide a link? Now you’re putting me off getting one! It’ll cost me about double the price they sell for in the US to get one here in Australia, so I don’t want it to break. I wonder if a solution might be to add another welded bracket to connect to the bottom of the kickstand plate? If the gap between the kickstand plate and the attachment that fits above it had spacers between them would you have double the support on the xtracycle frame? I don’t think this would put any extra load on the bike frame and might actually distribute it more evenly, top and bottom of the chainstays. Does this make sense or am I completely off track? I’d really like to know if they’ve done anything about this design problem before I part with my money. Jorge: Sorry, no links to shots of how I’ve done it; I was in a bit too much of a hurry to take pictures. Suffice it to say, I can do it for you if you want, and since I finished mine, I’ve had no fear of any loads, and no problems for over two years. Mark: the Big Boda is designed to fit on the most common bikes to be found in Africa, which are almost all one size. This makes attaching at more points easy, from a design standpoint. In order to be compatible with the vast variety of frame styles and sizes available in the US, a more stealthy and svelte mounting system had to be adopted. In theory, auxiliary mounts could be custom fitted to individual bikes, but I have not seen anyone get quite that ambitious yet. David: the design only has a problem in more extreme situations. The folks at XtraCycle are actually considering making a more heavy duty version, for those of us who actually like to carry 100-300 lbs over rough roads every day. This sort of mayhem was not envisioned when the original was designed, and the vast majority of XtraCycle riders never reach this level, and never have any problems. As with Freeriding and Downhill, the genre has evolved faster than the equipment, and we are at the cutting edge. You should think carefully about what you plan to do with the bike. If your average load is unlikely to exceed 100 lbs, and you don’t tend to destroy the equipment you are riding on right now, a standard X will probably be fine. If you are crazy enough to keep trying to find loads that are actually too big to carry, and then carry them anyway, and you have ever broken a frame, a pair of cranks, or a pedal spindle, then you might want to think about a Big Dummy, since I won’t be able to customize a FreeRadical for you in Oz. Cheers! Val, is xtracycle aware of your mods? I am in oakland, next door to them and intended to pick one up directly from them. I don’t intend to overload it or take it off road, I am a big dude however and have broken a pedal in the past. I wish you were local cuz your shop seems to be the most experienced I’ve ever seen with this product. I undertand if you want to keep the mod a “shop exclusive” but shipping to you would be cost-prohibitive. Any options for me? Pps do you have an ETA on the heavy duty xtracycle? Jorge: Indeed, when I modified the FreeRadical for the RtS boys,at the behest of XtraCycle, I did one extra and sent it back to X central, so they could check it out. So far, they haven’t mentioned anything, so I couldn’t tell you about an ETA on the beefy version; perhaps they will have more info. If you do decide to let me ramp it up, the charge is $150.00, and I think that shipping from CA should be under $20.00. I don’t know what a heavy duty FreeRadical will cost, but we’re still well under the price of a Big Dummy, which, don’t get me wrong, is well worth the price. My best advice: you won’t regret getting the XtraCycle, and if you break it, you know what to do. Also, as far as the stands are concerned, the website ( http://www.rollingjackass.com ) should be up and running within a month (or two, if complications develop – no longer). Check it out, after a bit. David, once I got to actually get “up close and personal” with an Xtracycle (as I was building my own up two weeks ago), I envisioned the EXACT SAME break you experienced. That weld and the attachment area for the tongue just look SO insubstantial. I think I can figure out a way to reinforce this area, but I’ll need to find a welder locally to help. Val, if the Xtracycle is rated for 200 lb., then shouldn’t it be able to do that without modification straight from the factory? It doesn’t matter that most users won’t hit that limit — if a product is advertised as capable of such, it should do it right from the get-go. Also, $150 seems awfully steep for a repair/upgrade with no description and no photos demonstrating the mod. 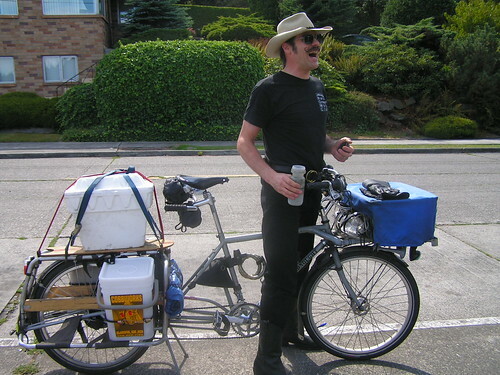 Jack (G.R., that is): Once I got mine built, I found that the XtraCycle is actually capable of carrying up to 350 lbs. without modification. The rated weight limit is there for legal protection; if you never put more than 200 lbs. on it, it won’t fold from the load. The type of failures we see here are fatigue induced, rather than failures from catastrophic stress, and many more variables enter into that equation. As a comparison, mine is on a nice solid steel mountain bike frame, and in the same time period I have broken that frame three times. I realize that I am putting much more stress and more miles on the whole system than it was ever intended for, and I’m coping by reinforcing and learning as I go. Sorry I don’t have pictures; what can I say, I had to get them out the door, as those crazy riders needed to be on the road. If I do it again, I’ll try to rectify that. What I’ve done is to focus on all the spots that anyone I have ever heard of has broken one at, and reinforce these spots not by simply adding more metal, but by redistributing the stress over a larger area, in such a way as to avoid causing a break right next to the reinforcement, which is fairly easy to do with this type of modification. Lightweight trusses and gussets are the main elements. I know that’s a bit vague, but specifics get a bit cumbersome. Val, I can live with your explanation! Sometimes, documenting things gets missed in the shuffle. Yeah, I figured the 200 lb. limit was conservative (Lord knows I’ve seen much heavier loads in the Xtracycle “user gallery”). While I probably will only hit that conservative load on occasion (6 bags of groceries, a child, a neighbor bumming a ride, the now-and-again trip to the hardware store), I am concerned about the longevity of this beauty…and may look into some reinforcements. Gussets and trusses sound just right for that area. I’ll talk to some local welders to see what they might be able to do for me. Is this your mod, Val? -They are pretty confident their product won’t fail. Perhaps because they assess warranty replacements and don’t see patterns indicating a need to change or reinforce the design. He even mentioned seeing xtracycled tandems etc. I intend to mod anyway cuz I’ll be xtracycling my rans stratus xp plus adding an ecospeed unit down the road. An extended range commuter truck basically. Jorge: Indeed, that picture was taken by me (since inadvertently deleted from my computer), and shows the front half on one modified FreeRadical. I haven’t looked that closely at that RtS post; do they show the back half? Sheer amusement at XtraCycle’s official statement – they contacted me, and paid for the mods on the frames, as part of their sponsorship of the ride! I can see that they would not be willing to cover XtraCycles randomly modified by anyone with a torch or an arc welder, though, and they haven’t contacted me about doing any more. As I say, for the vast majority of the use that their product gets, there is no problem, and a few warranty replacements is really much less expensive than developing a new product. At the moment, they probably don’t see the “heavy duty” market as being all that big…time will tell. So, summing up: My modification is not officially sanctioned by XtraCycle, and will void the warranty, but the experience of the folks Riding the Spine indicates that one modified this way should last at least four times as long as the original, and I personally stand behind my work. Roll on! So, you do all of that for $150? And when you say you stand behind your work I assume you’ll make good if it fails under reasonable circumstances, like, oh, I don’t know, riding the spine? Sounds very reasonable. Does that include a powdercoat or rattle-can primer? Yep, all that and a (very) basic paint job that very nearly matches the original. If any area that I reinforce breaks due to anything short of a crash, I want to see it, understand it, and make it better, at no charge. If some area that I did not adress fails, I would probably charge a bit more for the additional work. So far, all the spots that I have seen fail are included in what I do. So far, I have had no specific feedback from the RtS boys, which I assume is good news; they have many other things to worry about. Either my shop or Haulin’ Colin can fix it fast. We had one customer with a Stoke Monkey break in the same place. We fixed it in an hour and a half! 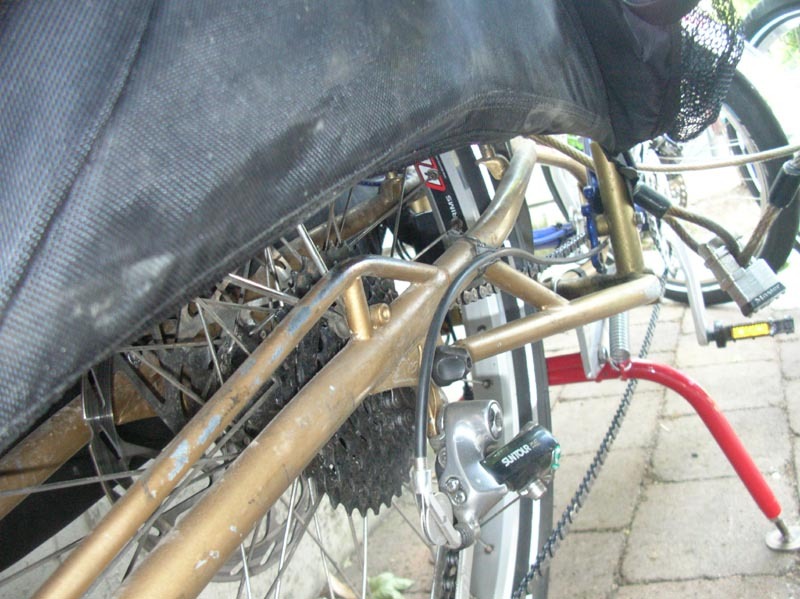 Xtracycle is designing a new tounge that will be brazed on and solve the problem. They have beefed on recent FRs but they cause problems on some installations. 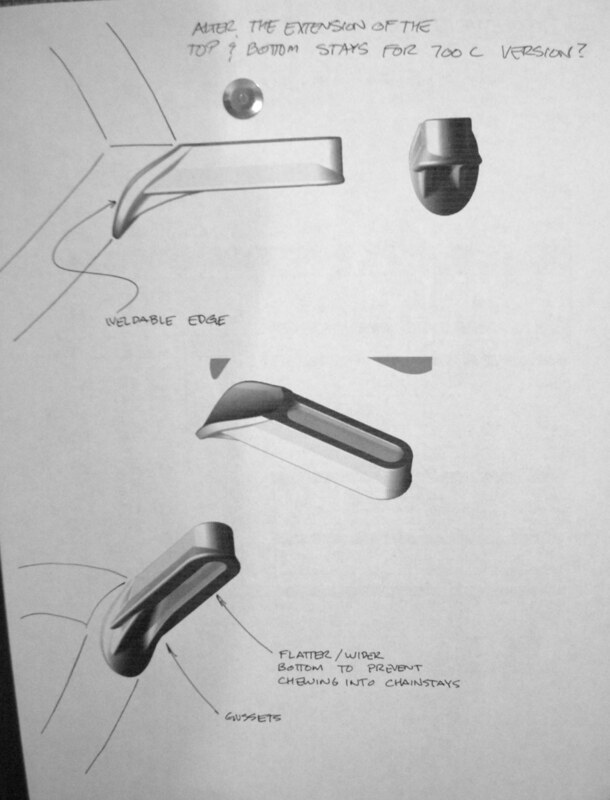 Here is a spy photo of the new tounge that will be strong and easy to install. It will also spread the load out on the chainstay bridge. For the record, I too haul overloads on my X and I have broken my SUB frame 3 times. Par for the course, I say! Val reinforced my X exactly the same as the pics shown above. The only 2 spots he did not do were the tounge and the front gussets at the back of the tounge-tubes. The Rear “bridge” and the small slant tube solve the breaking of the X in the rear. The new cast tounge should solve tounge failures. 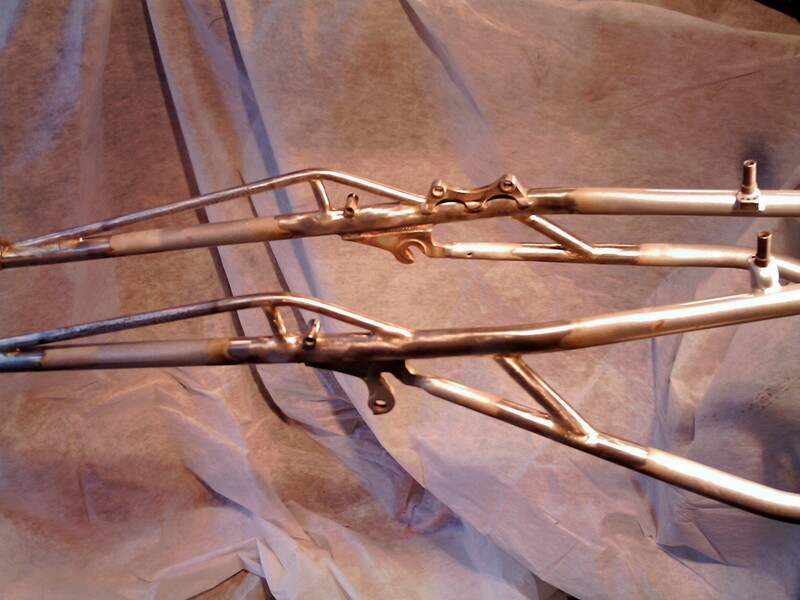 I noticed my tounge cracking once and had a small square plate brazed on top of the tounge. I’ll post a pic. It seems to be holding and no sign of other cracks. When I talked with Nate at Xtracycle during the Bicycle Music Festival, he said they did not want to build a beefier version because that is the Big Dummy. Also he said they were worried if they reinforced the current version that it would just fail some place else. He did mention they are thinking about making a 29er compatable version. I guess some people like those big wheels. I ride 24×2.35 Big Apples myself. Kipchoge Spencer (co-founder of Xtracycle and CEO for the last 10 years) told me the only 4 places they have seen failures are: 1. 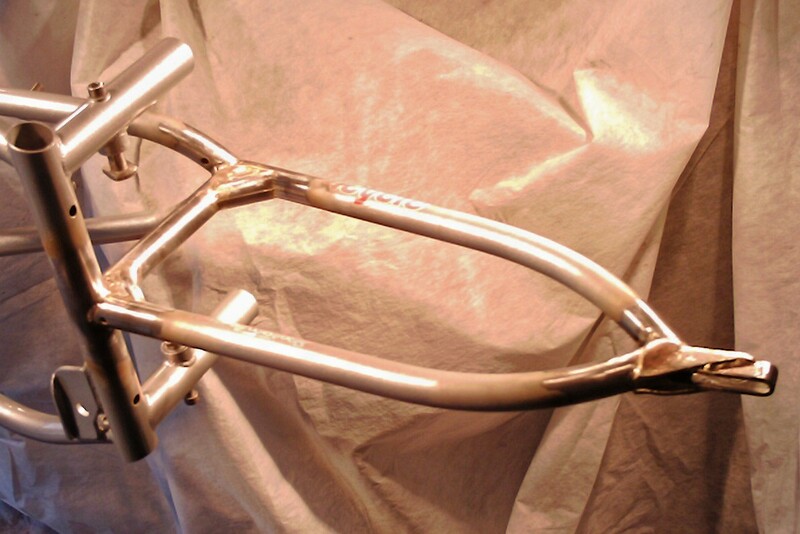 Front of Drop-out (drop-out breaks not tube) , 2. Behind drop out plate (tube breaks), 3. Tounge, 4. Cracks sometimes develop around one of the holes for the Wide Loader snap-in buttons (front holes). When I visited Xtracycle, I checked out their warranty bin of broken Xtracycles. Those were the only 4 failures I saw. I did see some bent ones! The long extension tubes can bend behind the drop-out if you overload. I did that to my prevous Xtracycle (which is still on the road, but I got a new one for a disc brake). Here is a great pic of Val! and me discovering my first break in my Free Radical! Be happy if you break yours! It means you are using it hard! You can see Val’s Rolling Jackass centerstand in the second pic. Be proud of your creeks and FreeRad cracks. When they see what can be done without the car. So you don’t need that sissy truck!! Fare well and good luck! I’m a mommy who carries kids, groceries, ironing boards and sewing machines (sometimes all), and I’m uninterested in my X or bike ever breaking. However I’ve enjoyed reading this discussion a lot. I’m glad to hear about this 350 unofficial “safe” upper limit, too. Now what I really want to figure out is how best to protect three of us from the very very long and very very wet rainy season to come (last year I had kiddos in a trailer which kept them dry). Yes, yes, I know, humble concerns from a practical pedaler. Hey Sue — I think the xtracycles with the beefed up tongue should be in soon. If that is your problem, that’s always an option. However, the downtime could be a problem. I wonder if they’d be willing to do a swap like tech hardware companies often do: You give them a credit card and they send out the frame. If you don’t send the frame back in 30 days, they charge you for it. Something like that. On the other hand, if you have a capable welder that might be the way to go — especially if you can get the X folks saying that they OK the repair and it won’t void a future warranty claim (they did this for me when I had a problem w/ my derailleur hanger alignment. They said I could grind it and not void the warranty. One other point — I’ve had two other creaks that I’ve been able to silence with lube. One was the T-nuts or whatever they are called — where the X mounts to the donor bike dropouts. The other was my brooks saddle — the tension bolt of all things. Hmmm..didn´t get to read the whole post and comments.. but…. 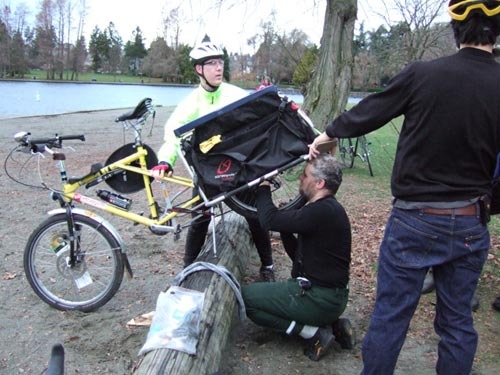 YES do send back to Xtracycle…they have amazing customer service and will certainly fix it up for you. If you can´t wait…you could find just about any welder will be able to fix it for you…maybe add some extra beefy plates to reinforce it. I hear Xtracycle is working on a stronger model for people who use theirs often. We are using a modified version with rienforcements that have been pretty bomber….somewhere in our blog posts we have pictures of the modified versions. I think for the most part the Xtracycles are designed for serious commuters, car free living, and are designed with that in mind…so going off curbs and offroad, etc. can take it´s toll on them. Anyways….hope you get that all worked out. Indeed. They are taking care of me. It’s just that I have a “spare” (who doesn’t, right?) so I have been lazy about sending it back. I’ll get one with the beefed up tongue and it should be good to go! Thanks for the comment, Jacob! A little late, but my X cracked back in July. Xtracycle warranteed the frame but I had to wait for the slow boat from China(1 month and a half). It is the new frame with the new Freeloader strap attachment points. But they never redesigned the tongue. I probably will reinforce that area, if a problem arises.